Greetings, readers! On Saturday, we got to sleep in- a little. Our interview schedule was deliberately not as busy as Friday’s because Saturday we had scheduled our listener meet-and-greet. As it happens (when you’re talking to Incredibly Interesting People), we ended up being a few minutes late, but our listeners were CHAMPS while we got set up. We met SO many listeners, and were completely overwhelmed by all of the kind words, hugs, and smiling faces we were met with. 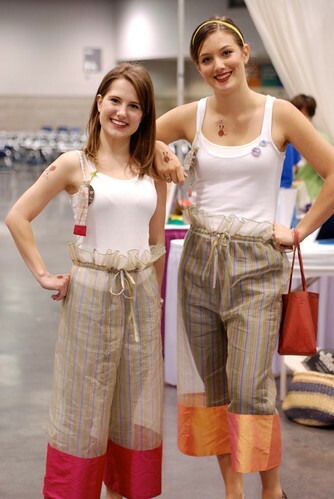 We felt like a couple of knitting elves, giving away goodies. It was 100% awesome. Our listeners are also incredibly talented. 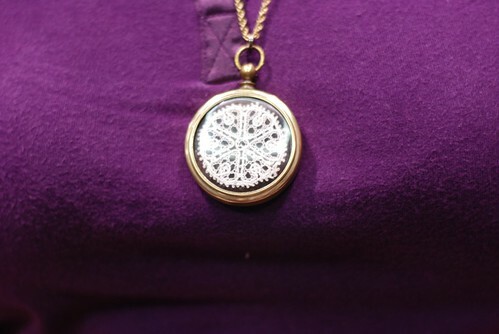 The first listener that we met today was wearing an utterly stunning pendant, which she made herself. We got to knit on a wedding shawl. We were totally overwhelmed! It was great. After the meet-and-greet, we grabbed some quick lunch and walked the market. You know how sometimes you hear that something is really great, see it, and get totally blown away? 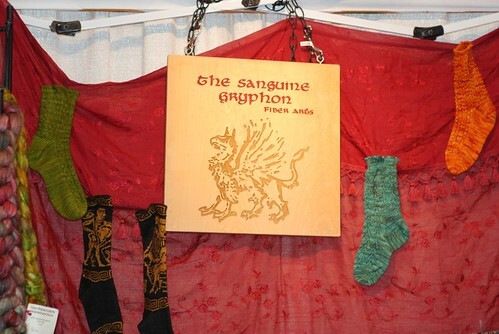 Welcome to my introduction to the Sanguine Gryphon. They had utterly stunning yarns, and couldn’t be nicer people. I was overcome by the beauty, and had to sit down. While I was sitting, I was actively enabling others to partake in the beauty. When we finished there, we were hitting the last few booths, we ran into the Sox Stix Booth Bunnies! 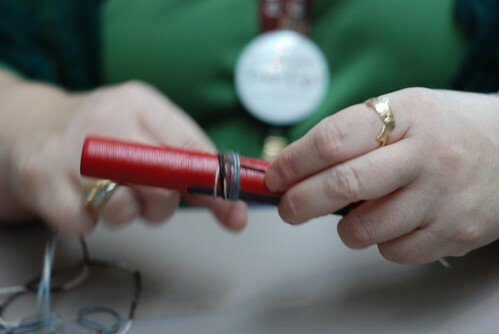 While we waited on our dinner plans (with Susan and Gail from Abstract Fiber), Judy Becker taught me how to use a nostepinne. 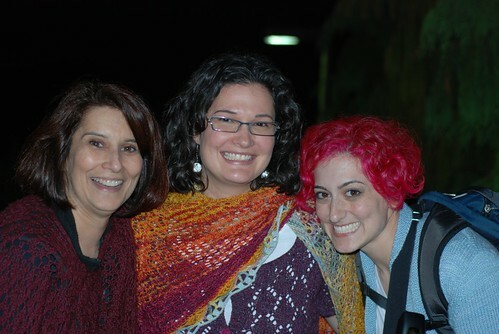 After a delightful seafood dinner, we headed over to the Ravelry meetup party. Wow, Jess and Casey really know how to throw a shindig! We arrived around ten, and the party was still rocking. Mom and I got to meet more listeners, and chat with friends that we don’t often get to see. It was totally awesome. We had another one of those “I-know-you-on-the-internet-it’s-great-to-meet-you-in-person” moments, with none other than Turtlegirl76. The party started wrapping up around 11, but we weren’t done yet. Lisa invited Cristi and Stacey back to our hotel for some wine and pleasant conversation, and wow, did we have a great time! 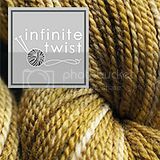 Put a bunch of knitters together, and let the good times roll. Stay tuned for Sunday’s wrap-up update! Jasmin, is the cardigan you're wearing handknit? Details, please!!! Is that your Katarina Jasmin? The updates are great. Looks like yall are having a good time. Love the pink hair, but not near as much as my daughter. I'm also going to ask for the details on the blue cardigan. Thanks for keeping us in touch with the Summit. I am eagerly looking forward to hearing all about it. OMG!! So great!! that is a beautiful wedding shawl and that necklace...wow!! We knit on the wedding shawl, too- what an incredible idea! I was so touched. And thanks for the shout- out! I can't TELL you how much I envy you the interview with Barbara Walker.